President Donald Trump’s pardon of former Maricopa County Sheriff Joe Arpaio divided Arizona Republicans Friday, with Gov. Doug Ducey calling the ex-lawman a friend and U.S. Sen. John McCain criticizing the decision. On the day President Donald Trump is scheduled to arrive in Phoenix next week, two dozen Arizona legislators will be leaving on a goodwill mission to Mexico. After casting the deciding vote that derailed Republicans’ seven-year quest to repeal the Affordable Care Act, U.S. Sen. John McCain is headed to Arizona to resume treatment following his diagnosis of an aggressive form of brain cancer. Walmart, the world’s largest retail company and Arizona’s second biggest private employer, says key changes in state and federal policy, particularly surrounding regulation and taxation, would result in a boom in domestic production and the creation of millions of American jobs. Former Attorney General Tom Horne, who was hounded by allegations of illegal coordination throughout his unsuccessful bid for re-election in 2014 and faced a $400,000 fine, has been absolved of wrongdoing by Cochise County Attorney Brian McIntyre. The Arizona Capitol Times has won more than a dozen awards in the latest Arizona Press Club’s writing and design competition. The lobbying arm of Arizona’s school boards is threatening to sue over a proposed amendment that would require 50 percent of inflationary funding increases for K-12 education to be used for teacher pay raises. The court said the law imposed an assessment that is exempt from the requirement that any act by lawmakers increasing state revenues, such a tax hike, must get a two-thirds vote in the Legislature. At the core of the discussion is an ethical question: In a life or death situation, should machines be permitted to make choices about who gets injured, or worse, who lives or dies? 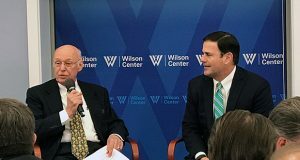 Donald Trump’s crackdown on illegal immigrants puts the spotlight on border governors like Doug Ducey, who must decide whether to fully cooperate with the U.S. Department of Homeland Security and allow their state’s law enforcers to act as immigration agents.